It never ceases to amaze me the places or times at which I find myself inspired by colour. I've long admired great design and packaging - you only need to look at some of my Pinterest boards to see that - but when I saw this tempting collection of vintage-style, glass sweet jars all I kept spotting were the lovely hues. From the festive feel of the red and white duos to the pink and green jewel-like tones, it's safe to say Mr. Bazaar was feeling inspired. Now we've all reached the weekend, I think it's fair to say we deserve to grab a swizzle stick, put our feet up and dive into our favourite magazines. What do you say, folks?! Have a lovely weekend! 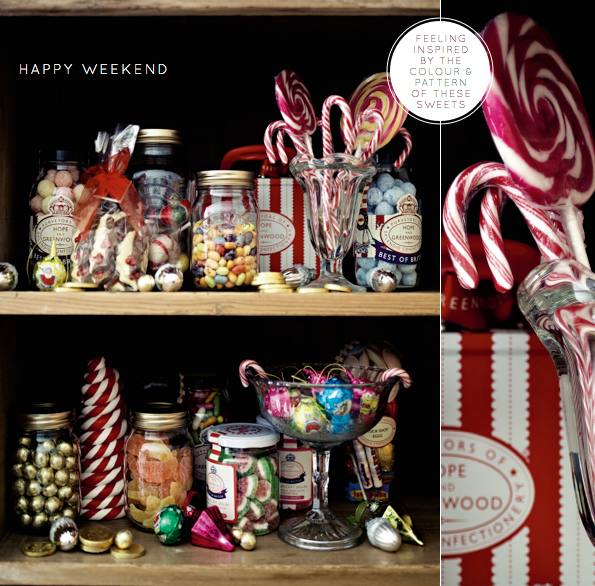 I love the use of vintage jars to display colourful candy! ps. I'm trying to plan a trip out to London next spring to visit my sister and family. I would love to meet up with you! Seeing all the candy displayed like this brings back great memories when my grandmother would have candy out for her guest around the holiday time. I hope your off to a great start to your weekend. these vintage jar are adorable, and love the candy inside! Inspiring indeed...have a great weekend Will! Wonderful colors and wonderful packaging! And yes, I´m a bit exited myself about Selina´s book. It´s amazing what blogging can do! Yummy! That looks delicious! A little relaxing with magazines sounds lovely! @Renee - Defo, we have to meet when you come to London... so exciting! @Tonia - The candy wrappers bring back memories for me, too! Thanks for sharing yours. @Ann - Always a winning colour for this season. @Melissa - Magazines are my ultimate for relaxation - love them. Hope you had a lovely weekend!